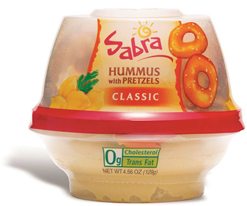 Sabra Hummus with Pretzels. Pure fresh chickpeas ground with a touch of tahini. Of course they come with fresh pretzels in a single serve cup. ITEM MUST BE REFRIGERATED. DELIVERY IN METRO ATLANTA, GA ONLY. NO UPS SHIPPING AVAILABLE.